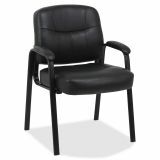 Lorell Chadwick Executive Leather Guest Chair - Executive guest chair offers a sophisticated look for any lobby, reception area or conference room. 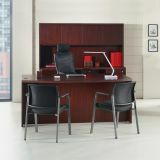 Design features fully upholstered seating with black, split leather for a rich classic look. Guest chair features stylish open loop arms and a black steel frame. Seat height is 18-3/4. 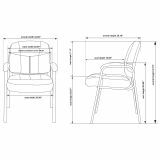 Chair meets the CA117 fire-retardant standard."